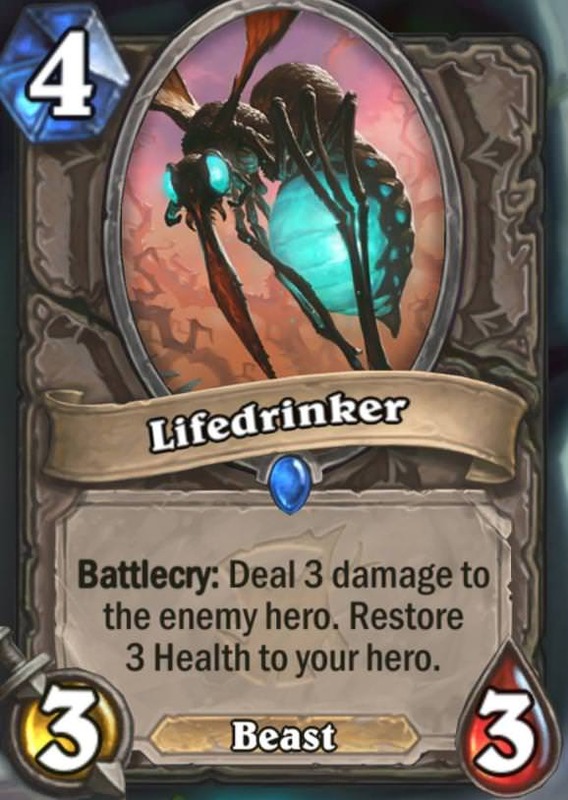 A fatigue death is the most noble of deaths, right after pinging your own face at 1 health. OH MY. I saw the ''Discover a Battlecry'' card and was so thrilled since i had done a battlecry deck having randomly picked shaman to do it bout 2 years ago. And now this it's beautiful. Too bad Vorpal Dagger is dungeon run only. P.S. a tip, because order is random Murmuring guarantees Grumble effect to actually return some copies. you can also play this to fetch your elementals. Sick! A full guide is up too. I can't wait to test it out ! your list is not very optimized... like Brrrloc is a questionable inclusion... 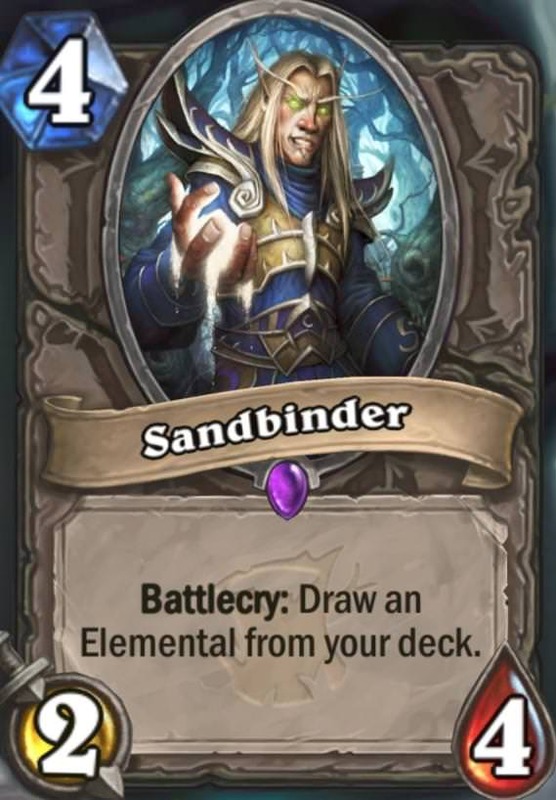 There are a few similar decks flying around (this idea first came to be in Kripparian sub chat, so we had a decklist in mind of our own) you might want to avoid battlecry AOE though too... well I'm sure once expansion hits the release people will optimize the deck, especially if it is indeed viable. They even make extremely loud noises and shoot lasers from their eyes. Wow, maybe, SHUDDERWOCK will act like pre-nerf yogg ! Like, we know that Tess Greymane will continue her battlecry even if she dies. So, maybe, after playing Yogg-Saron, Hope's End, and then, Shudderwock, probably shudderwock will continue casting spells like the old yogg ? can't wait to test ! Insane with jades in wild. Also if you x2 a battlecry with Brann, will it come back twice over with Shudderwock? Imagine getting the Shudderwock off of a steal card. You play Tess to fire off your other stolen cards, then, next turn, play the shudderwock to do the same with all your battlecry effects, including Tess's, which fires off another copy of every stolen card you have played (including another copy of the shudderwock without the battlecry. Then, next turn, if your opponent cannot clear both shudderwocks (or if you simply decide to shadowstep one of the ones you have on the board), you use zola the gorgon to get another copy in your hand, who will fire off the battlecries of both the first tess and the first shudderwock, which will cause another triggering of the tess battlecry while potentially giving you another shudderwock from your zola battlecry. 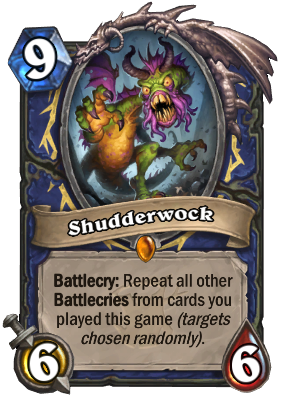 If you used the shadowstep, you would end up with another shudderwock in your hand, which would trigger two more shudderwock battlecries, three tess battlecries, and two zola battlecries. Needless to say, there is absolutely no way to predict how this would work out, but it would be a really amazing situation. "Beware the Shudderwock, my son! The Jades that grow, the Elementals that burn!"